Recommended for light civil and construction projects, this 100 metre kit includes 40 temporary fence panels. The 2000 Series temporary fence is easily erected to secure your site. 100 metre package includes 40 x 2000 Series fence panels, 40 x coupler clamps and 40 x fence feet - everything required for installation. For a simple light duty solution, the Fortress 2000 Series is a light, low cost temporary fencing panel that offers great value. Featuring anti-climb mesh for added security, this sturdy fencing panel is easy to install and will keep your site safe. Plus, it can be installed by just one person. Each panel measures 2.1 metres high and 2.4 metres long, and provides instant security to your site. Fortress Fencing temp fencing panels are strong and durable, whilst also being lightweight and easy to install. They are perfect for construction sites, road and civil works, enclosing hazards, concert and festival crowd control, event perimeters, environmental control and general road and maintenance works. This kit includes 40 temporary fence panels, plus the required clamps and bases for installation, resulting in 100 metres of continuous fencing. 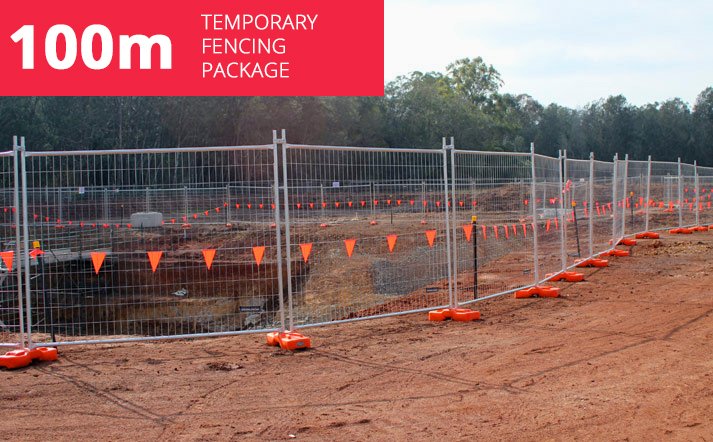 Constructed to meet Australian Standards, the 2000 Series temp fence is tough, lightweight and always in stock – with dispatch locations in all capital cities around Australia including Sydney, Melbourne, Brisbane, Adelaide Perth and Darwin, the 2000 Series is always available for fast delivery. Fortress Fencing can also provide custom colour printed fence mesh, fencing fabric, shade cloth, construction mesh or scrim to promote your brand or company. All of our printing is done in house in our Arndell Park facility, and we can reproduce any logo or artwork turning your site into an instant advertising opportunity. Our friendly customer service specialists can offer advice on the best solution for your project and are always happy to help – if you need assistance, give Fortress Fencing a call on 1800 809 809.